I think Augusta National must be the Narnia of golf courses. First of all, Augusta manages to make golf exciting at least once a year. Second, and more important to someone as terrible at golf as I am, their food is legendary. This is impressive because the sandwiches are made on white wonder bread and there is nothing on the menu that anyone with even rudimentary cooking skills couldn’t just make at home. But somehow, pair it all with the biggest golf tournament of the year and price the food like its 1969, and you’ve got magic. So if you can go to the Masters, buy one of everything (it will set you back $37.75 to buy the whole menu). If you can’t make it to the Masters, you can still put on your best plaid pants, turn on the TV, and make some Augusta food at home. 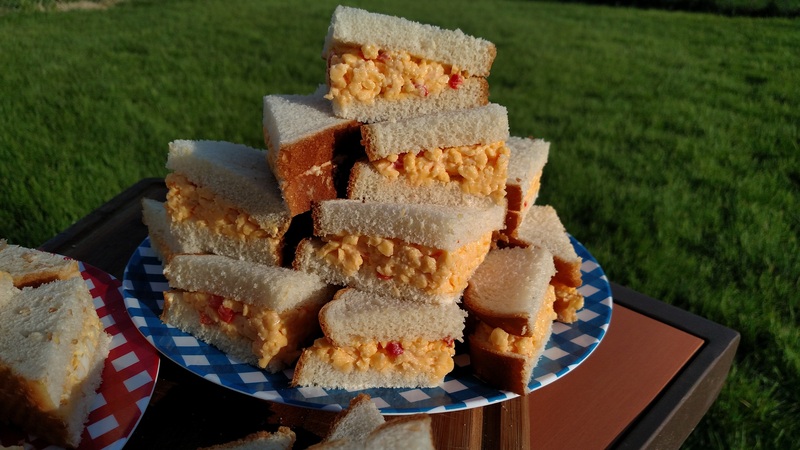 When people talk about food at the Masters, the famous southern pimento cheese sandwich ($1.50) is at the top of the list. The recipe is shrouded in mystery. According to the packaging from last year, these are the ingredients: extra sharp cheddar cheese, monterey jack cheese, mayonnaise, cream cheese, pimentos, onions, salt, black pepper, garlic powder, cayenne pepper. Of course, some claim that this recipe (post vendor change) just isn’t the same as it used to be. So if you’re obsessed with authenticity, you can join the online wave of people claiming to have dissected the sandwich and gotten the recipe exactly right. If all you want is a delicious sandwich, play with the recipe until you get something you like. Mix well, spread on white bread. 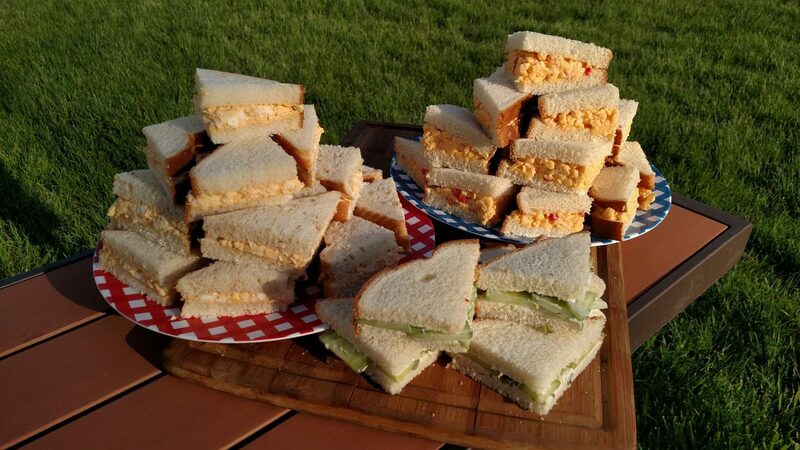 The other staple at the Masters is the egg salad sandwich (also $1.50). 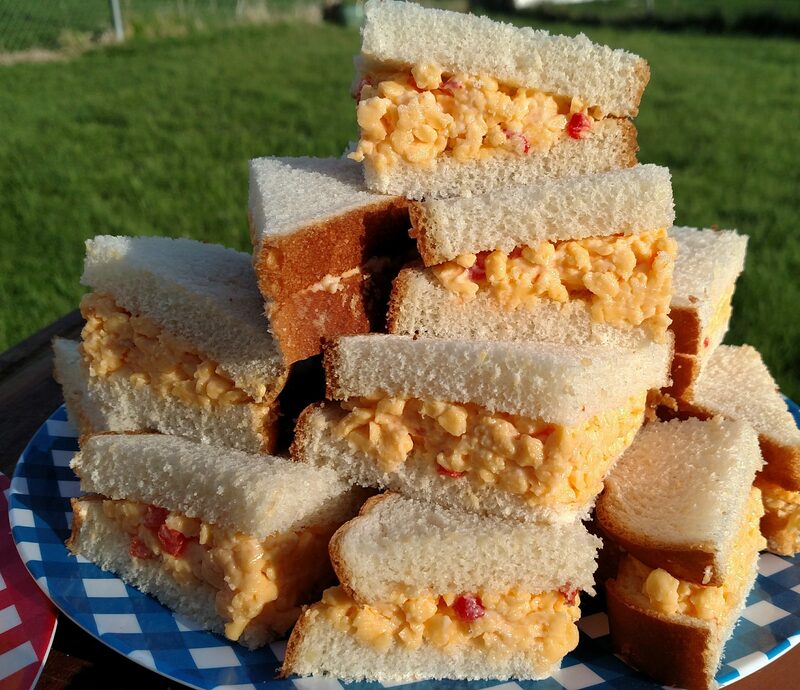 This is another secret recipe, but at its heart it is a simple egg salad sandwich with no exotic ingredients. 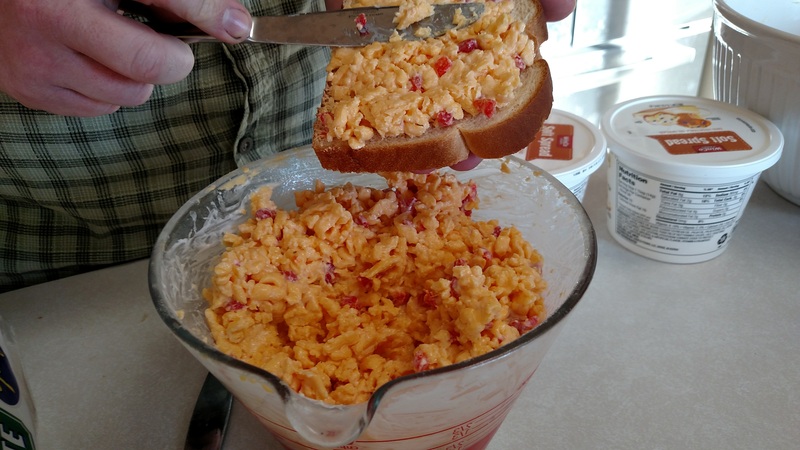 You can make whatever kind of egg salad you want, but here is a basic recipe that keeps it simple. Chop or food process eggs to the consistency you’d like in the sandwich. Mix with other ingredients until blended. Spread on white bread. Cut in triangles if you’re feeling fancy. We also made cucumber sandwiches, because it seemed wrong to have an assortment of white bread sandwiches without cucumbers involved. These are non-canonical, as they aren’t on the Augusta menu. 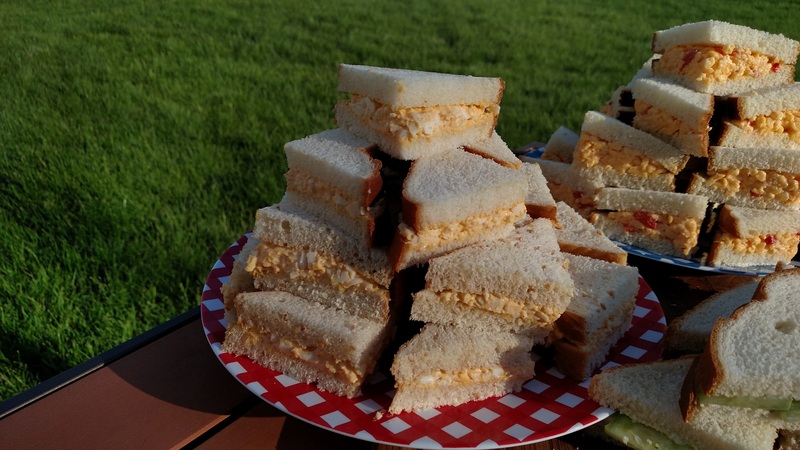 I enjoyed the cheese and egg salad sandwiches at our Masters party, but the ice cream sandwiches ($2, only for big spenders) were definitely my favorite. We couldn’t find peach ice cream, so we ended up making our own. The fresh, fruity ice cream between two soft sugar cookies was the perfect way to end a meal. They were so good and disappeared so fast that I didn’t even manage to get a picture. We’ll just have to make more this weekend. We hope you enjoy all the golfing—and eating—this weekend. Happy Masters!